Some medicines are necessary to stay fit. But the spiraling cost of medicine is making staying healthy costlier! That is why you will be happy when you visit VitaCost. This website offers the lowest prices for even branded over-the counter medicines. No matter what kind of medicine you are looking for, like vitamin supplements or diet supplements, you will find it here at VitaCost. It also offers the well researched Nutraceutical Science Institute brand of nutrients. 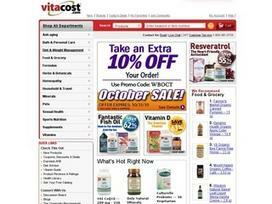 If you are looking for information from the medical world, you will find all of it at VitaCost. Just browse through its Science/Health Library, and you are sure to find what you are looking for. If you want to just read the latest news from the health world, don't forget to check the Featured Health Topics section. VitaCost is the destination not only for people looking for medicines, but also for physicians who prescribe them. The home page of VitaCost is systematically arranged. On the top you get the various sections like Vitamins and Supplements, Herbs, Diet and even Homeopathy. In the lefthand corner is the very effective search option, in which you can search the item you are looking for by typing its name. You will be surprised at how many options your search will uncover! If you know what brand you are looking for, you can directly go to the brands section and find it from the listing of all brands in the market. You will never think about going anywhere else, because of the range and prices offered by this website. As for the products range offered by VitaCost, you will have to see it to believe it! From vitamins and supplements like "NSI Vitamin-B Complex" to "Maxi Health Calcium Magnesium Complex" to "Chandrika Ayurvedic Soap", you will find everything here. Looking for a diet supplement that will help you lose weight? Then see the diet section of VitaCost for products like "BSN ASTRO-PHEX" or "iSatori Technologies Curvelle". If you are suffering from any kind of sexual disorder, a discreet look at the Sexual Health section will help rejuvenate your conjugal life! From libido support herbs like "Nature's Way Maca Root" to pleasure kits like "Emerita Joy Box", you will find everything here at VitaCost. But the best part is that you can have them at amazingly low prices. Buy even homeopathic medicines like "Himalaya Herbal Healthcare Ginger Digestive Comfort" or "Boiron Arnica Gel" at competitive prices. If you don't find what you are looking for, the VitaCost purchasing department will try its best to find it for you. And you can be sure about the quality of the product sold from here, as VitaCost regularly performs random tests. All online transactions are secure because VitaCost uses SSL 128-bit encryption with Comodo for maximum security and privacy. Brand exclusions include: California Baby, Greens First 'Dr. Bronner's', 'Dr Hauschka', 'Metagenics', 'Biotics Research', 'Country Life', 'Iron-tek', 'Biochem Sports', 'Thorne Research', 'Nordic Naturals' , 'Solgar', 'Sante Active','Logona Naturkosmetik', XLEAR, Ortho Molecular Product, Redd Remedies, Progressive Labs, Pure Encapsulations, Designs For Health. Share what you think about VitaCost, and your favorite ways to save there!